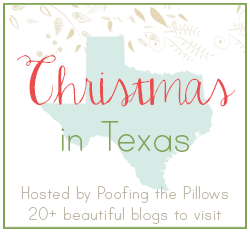 CHRISTMAS IN TEXAS BLOG TOUR! Welcome to Texas Blog Friends. is our hostess and has done a wonderful job of planning for this week. Welcome to my home and please come in. and Christmas postcards from France! Please come in for a French Country Christmas. Santa stands to greet you and pointing the way past the dining room to the kitchen. This is the dining table all decked out in black, white and red. and I will share it later in the month. For today, let's just relax in the kitchen. It seems to be the room where my family and friends love to gather. Decorated in Black Toile, Buffalo Checks in Black and White with pops of Red. This holiday I decorated with everything I just had in my Christmas stash, but in a different way. pops of red sets the style for my French Country Christmas. and topped with a small grapevine wreath, winter greens and red ribbon. pedestal filled with sugared pears, apples and a large pillar candle wrapped in a buffalo check ribbon. Easy to pick up and move when the table changes for a dinner. all in black and white with red. and topped each with a paper poinsettia over a sticky dot. Easy to change out for seasonal holidays and special occasions. I have a built in hutch that has become our cookie and treat area for Christmas. This cabinet holds my teacup collection but I have plans for change after the holiday. 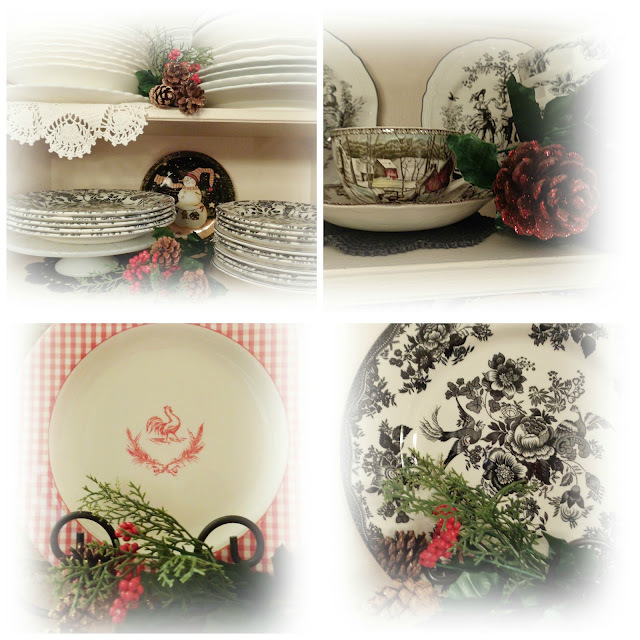 Opening shelves hold touches of Christmas among more black and white treasured dishes. and it opened up the area. Moving around the room little vignettes greet the eye and bring a smile. and seems to stay busy all day long around here! I painted Santa on the tray and this comes in handy to serve guests when they visit. fun this time of year. The rolling pin to the right has a little Santa on it I painted years ago. in hopes that some baking soon would appear! I remember my mom and grandma wearing these aprons. Each stitch done with love! cook books are ready and standing near by. with a corner tree in traditional colors. I love a little lamp bringing a cozy touch to the kitchen. sitting on a large red platter atop a toile and black checked runner. Again, easy to move when I need the island for prep work and serving. Holiday wall art is placed here and there around the room for the season. My favorite is the framed art over the stove. so many years ago ~ I've lost count! A stocking is hung in true French Country fashion. with a plaid and white deer pillow. while enjoying a cup of Christmas joy. and hand painted the checks at the bottom with glass paint. and use them a lot in my paintings! the brick archway over the stove top area. for a cozy December evening. of my home for Christmas. Christmas in Texas Blog Tour. and all good wishes in the new year. you can visit these great Texas blogs. Thank you Stacey for hosting and all you have done to make it special. Gorgeous house !!! Just like we see in magazines !!! When it comes to decoration, I am really clueless and helpless! The things that really attract me are your Waverly Pastoral Toile Curtains, your black and white dishes and of course the French Country Fashion stocking. You've created a beautiful festive atmosphere with all your treasures and artistic touches, Celeste! I just love the old Christmas aprons!! Thank you so much for sharing your home with us! Celeste, I just love your house. That black and white toile and the checks is perfection! I love the little tree on the kitchen counter too. Your style is beautiful and your sweet personality always shows through. 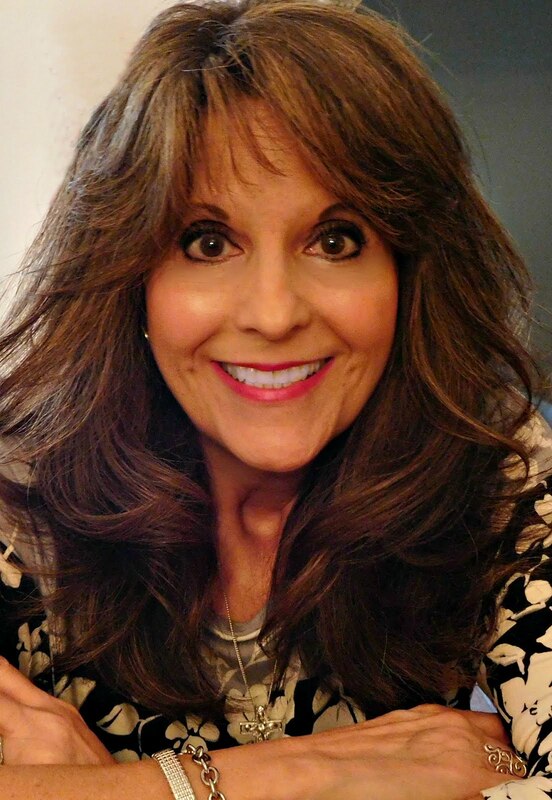 Thank you for being part of this blog hop. It is all so cute. I love black, red and white. The vintage aprons are adorable. So happy to meet another Texas blogger. I'm a fan of all things toils and the buffalo check is fabulous. I love how you have made everything your own, like painting that mug, so cute! Happy to be your neighbor on the Texas tour today! Wow! It's all so lovely I don't know where to begin! The wreath on your front door is absolutely amazing with the vintage postcards. So precious. And I love how you've put little touches all throughout your home allowing your guests to encounter Christmas in every corner. So well done! Very very pretty post...you did a great job. Thank you for inviting us in! Your home is beautiful, warm and cozy. Have a very blessed holiday season! Piękny świąteczny wustrój. Jest taki ciepły i przytulny.Serdecznie pozdrawiam. Wesołych świąt i dobrego nowego roku. Good Morning Sweet Texas Friend! Oh, I am enchanted with the use of black, white and red! Your home is wonderfully dressed for Christmas and filled with such love and oh your attention to detail is stunning! So enjoying how you have incorporated vintage postcards to your wreath and just look at these sweet aprons. Lovely. It's always fun to visit homes at Christmas and to see how others decorate and what traditions they hold dear to their hearts. Your home is beautiful for Christmas. What a treasure to have those vintage aprons from your mother and grandmother! I love all the black and white and Country French. Absolutely beautiful! Thank you, so much, for the inspiration! Your front door is so welcoming, Celeste, and I loved the peek at your DR, and then onto the heart of the home...your cozy, festive kitchen! I oohed and ahhed through each stop and vignette!! I have that same black and white checked tablecloth, and I love how you paired it with the toile and pops of red. Your mom's stitched piece just made my heart smile...what a treasure! Thanks for letting me in to take a peek around each nook and cranny. Love and hugs are sent to you! Celestina Marie I am swooning with delight over all your delightful French Country Christmas touches! I'll be featuring you in my tour round up this Saturday. Your kitchen is spectacular at any time of the year, but it really sparkles at Christmas! So charming. Enjoy it!! Oh Celeste, everything is so beautiful. I love the black, white and red together. Your kitchen is amazing. I don't really decorate mine-too small and I'd trip over everything. I love the tablescape so much. So many great ideas. The dollar store mugs that you added the checks, who thinks of details like that. Love it! Your tour is stunning! Enjoy you week! I am going to try to talk Steve into letting me take the doors off the little cabinets on either side of the stove. It's his kitchen, but I think it would look so cute. Well Oh My Word what a gorgeous kitchen! What a joy to be in there! I would never mind doing dishes! : ) LOL Thanks for the gracious detailed tour. I think checked and toile are the perfect blend of elegant and inviting! Thanks for sharing. Lovely French country tour my pretty Texas friend with a huge heart filled with love. I like the postcards on the front door and then realized you had probably placed them there as a poignant memory to keep rememberance this Christmas season for those who loss so much in Paris. I really adore your Red, Black and White Christmas color's. Adds a dramatic flair to your holiday décor. I loved seeing your Moms needlepoint and Mom's and your Grandmoms apron's displayed. There's much magical allure in your kitchen. I'd love to have a kitchen large enough to have a worn comfy leather sofa for company to relax on while I prepare the meal. Kitchens when you like to entertain and cook become like theatre now a days. I enjoy all your Santa's. This year I am crazy about Elves. Started out with Elfie and now he has 2 friends! Thank you for inviting us into your home and making us feel so welcome. Your kitchen looks beautiful all deck out in it's holiday finest! Love the red, black and white colors together. Everything is just lovely! Love the aqua chair! I always enjoy paying you a visit! Your black and white toile and the buffalo check is perfect. Such a lovely country look and so warm and inviting! Your kitchen is just Stunning! Thank you for inviting us into your home. Just loved touring your sweet and pretty home for the holidays. Your creative heart shows everywhere. So cozy and inviting. Beautiful. I keep saying you Texas gals know how to decorate for the holidays. Really enjoying the tours. I love those postcards in your front door decorations. Love the santa to greet all who come in. 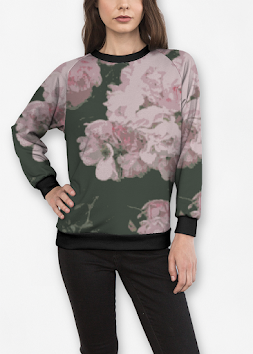 Love the color combo and the toile gives it an elegant look and feel to everything. Love your matching dishes to go with the toile and your stocking too! so special to have those aprons and the stitching your mother made!! It looks just beautiful all lit up too!! Your front door looks so beautiful all lit up! I am late, but I'm here! Bonjour, Celeste! How lovely is your French Country theme here! I love your toile de jouy fabric. Truly French! And your bright décor is indicative of your joyous spirit. I am having a fun time decorating this year in a French fashion, with natural elements and vintage items. ENJOY! You all out in Texas really know how to pretty things up. HUGS! Oh Celeste, this is just fabulous! I love red, black and white, and even have some of the same transferware dishes as yours in your china cabinet. The napkin rings are brilliantly done, the kitchen is absolutely wonderful, as is the passage to it. Thank you for the tour. Merry Christmas! Your house is always beautiful! It is especially gorgeous for Christmas. Thanks for sharing your home.. I know this takes lots of time. Now, that your tour is done...sit back and enjoy all the other homes. Have a great Christmas season.. Blessings! Oh Celestina, your home is just gorgeous all decked out for Christmas! I so enjoyed the tour, and just love your black and white toile. What a great idea for the napkin rings, they are so pretty! And I also love your vintage apron collection and the special piece your mom embroidered above them. As always, you pull everything together beautifully! From the inviting front door to the entry and beyond:) Oh, I also love the wreathes you hung at each window in your dining area. Can't wait to see more, thank you for the great tour! Beautiful decorating, the black and white just sets everything off nicely. Celestina Marie, So Proud of you and your beautiful house. Beautiful tour right from the beginning as we entered through your beautifully decorated door, Celestina. You have put your lovely personal touches throughout your gorgeous home, such detail,I just love it. If I were to say what I loved most this comment would go on forever, so I'll just say it's all absolutely gorgeous! Your home is warm and inviting with your photos, my how it must be wonderful in person. Thank you for allowing us a peek into your world. 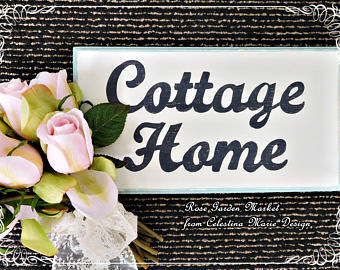 Love this country French touch for your beautiful Texas home. All the black and white with touches of red make my heart sing. I'm really crushing on that toile stocking! Thank you for this awesome tour of your charming home. Merry Christmas! Very (un)fashionably late to the party... Your home is divine!!! Love! Love ! The black and whet look! Spectacular and very dirrerent than the norm!! Great job! Beautiful!!! Celeste. your Christmas home is lovely! Your front door is so welcoming! I adore the French postcards on your wreath! I love needlepoint and cross stitch items. My Mother made so many special items too. Your Mother's Christmas sign is lovely and such a treasure! 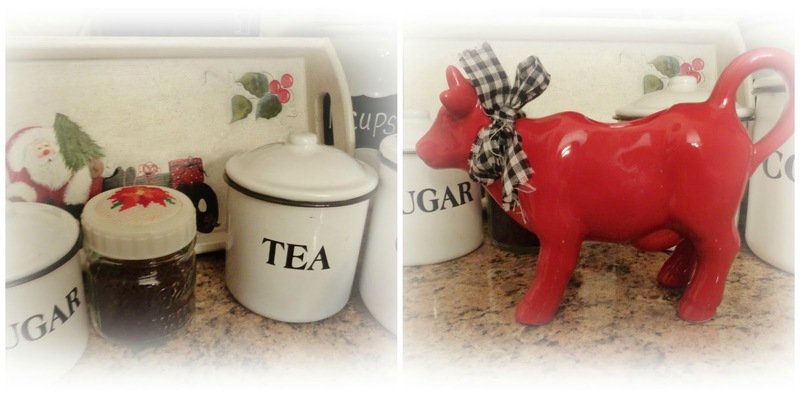 Your kitchen looks so pretty and festive with the pops of red among the black and white items. Your hutch provides the perfect place to showcase those special Christmas items. Thanks for sharing your marvelous Christmas decor with us! Ooh what a beautiful greeting starting at the front door! Love the sneak peak with the door open and the pretty hall table with the poinsettias! The French country accents are wonderful especially at your dining table… love the curtains! 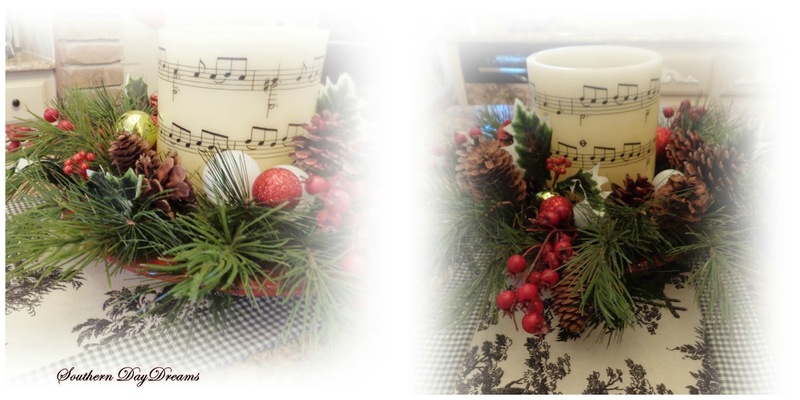 I really like the napkin rings you created with the musical gift wrap accent! The black and white checked ribbon and napkins add the perfect accent! I love how pretty you decorated your house for Christmas. Thanks so much for the tour!! Wishing you a wonderful day and weekend. What a beautiful home you have Celestine! I love all the attention to every detail and how wonderfully you pull everything together in design. I love the cow with the wreath so adorable! I have a white mom my mom gave me, but haven't had a chance to get it hung up in the kitchen yet. We've been here a year but there is so much I want to do! :-) Looks like you are all ready for Christmas. Have a wonderful day! Your home is beautiful! I love the dining room curtains and the pops of red with the black and white make my heart skip a beat! Seriously! so pretty. I always love how your decor includes memories of loved ones. The cow makes me smile! I want a cow... a real one... in my freezer LOL! Oh my, what a beautiful home! I love your kitchen! The black, white, and red look so pretty and fresh. And I ♥♥♥(that is 3 BIG loves) your china. Would it be possible for me to come over and bake in your gorgeous kitchen? :) Everything looks so beautiful and your use of black, white and red makes my heart sing! Love all the checks and the toile too. You have so many unique, special touches ~ the Santas, aprons and stocking, the little red cow ~ I have a yellow one. Your front door is stunning and the wreath and cards really make a statement! Thank you for inviting us in ~ a beautiful and delightful tour. Everything looks so beautiful for Christmas at your house!! I love everything!! My head is still spinning!!! So much to take in and I loved it all!!! I am ready to go back to the beginning of this post and look at everything another time or two!Merry Christmas!!! I haven't been visiting blogs for a long time, but I'm so glad I decided to tour the homes that Staceyhas featured. Your home looks beautiful as it always has. Merry Christmas to you and your family! Ooh, I just love the buffalo check and toile!!! So pretty! My other favorite thing is your vintage Christmas aprons!! Everything looks wonderful! Your home is so beautiful. I can't really pick my favorite pic but I have to say the last one with the table is just so warming to me. It makes me sad to be in the middle of a reno right now as I have no kitchen table nor a tree...lol There's always next year though!! Oh my do you have the Christmas spirit! So many wonderful touches. And so much from your own hand. Just delightful! Love the darling napkin rings you fashioned, and the Christmas aprons with your Mother's needlepoint made me smile. What a festive scene you have created. I hope it is a happy season for you! I wouldn't expect anything less from you on your Christmas in Texas blog tour, it's wonderful! First of all, your red door with the winter greens and postcards from France is just right for the season. I absolutely love that Santa in his plaid suit. Wherever did you find him? Haven't seen one quite like it. The black rooster with the red balls is charming, and the curtains are so pretty. The red ribbon really stands out. That little red cow is sweet too. Oh, I'm so glad I didn't miss this. 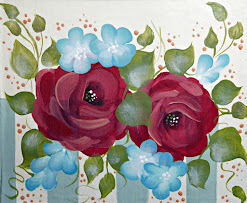 It's one of my favorites so far in the blog hop. Your home is decorated so festive, and there is a feeling of warm and cozy all throughout your home, especially in your kitchen. From the front door and all thru your beautiful home, I could feel the love and special touches. Your black and white plaid with red accents would be a big hit with me and your post a fabulous addition to the tour.